3D TVs are no longer being made for consumer purchase. However, there are still millions in use around the World. Even though 3D TVs have been discontinued, there are still many video projectors available that offer this viewing option. There is also a continuous flow of 3D Blu-ray discs and some 3D streaming content available to watch - at least for now. With that in mind, we are maintaining important tips that 3D TV and video projector owners can take advantage of to get the most of the 3D viewing experience. There's a lot of confusion regarding 3D as part of the home theater experience. What do you need to watch 3D? What is available to watch in 3D? If you are confused with both the hype and negativity you are hearing about 3D and went to gain an understanding the necessary fundamentals of the TV and home theater viewing option, get yourself started with some answers to basic questions. 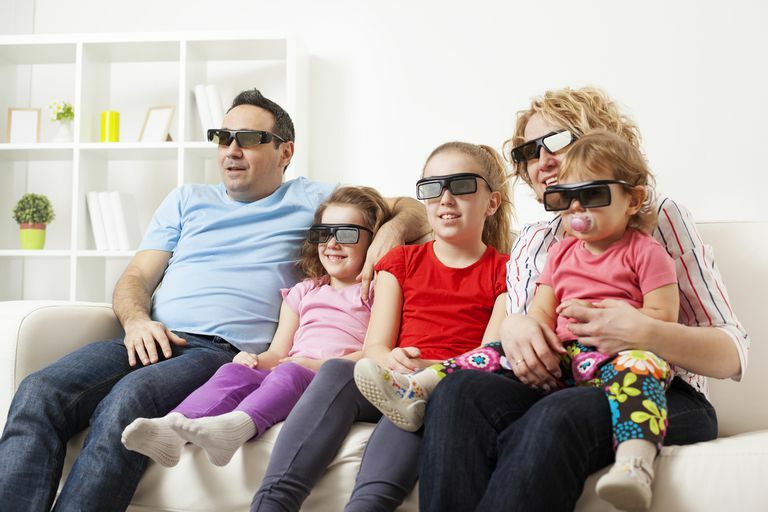 3D at home can provide an immersive experience for movies, sports, and games, and more, and some 3D TVs perform real-time 2D to 3D conversion. However, you're looking at spending quite a bit more money on home theater gear, and you might be disappointed in the amount of content available at this point. For help weighing the options, learn all about the pros and cons of 3D TV. Yes, glasses are required to watch 3D at home, but they aren't ordinary glasses, they are specially made for 3D viewing. All 3D glasses work by providing a separate image to each eye. The brain then combines the two images into a single 3D image. Unfortunately, not all 3D glasses work the same way and not all 3D glasses will work with all 3D TVs. Confused? Don't worry, find out what you need to know about 3D glasses. What About 3D Without Glasses? One of the big questions on everyone's minds is whether it's necessary to wear 3D glasses at home. Currently, all 3D TV viewing available for consumers has to be done by wearing 3D glasses. However, there are technologies in various stages of development that can enable you to see a 3D image on a TV or other type of video display device without glasses. We can help you get a better sense of where the technology is and what the hold-ups are to watching 3D without glasses. One of the frustrating things about watching 3D at home is how to adjust your 3D TV to get the best 3D viewing experience. Let's face it, most consumers bring their TV home, unbox it, go through any "quick setup" function, and leave it at that. The result is that the TV's quick setup or default settings may not be the best settings to use when watching 3D. What happens next is that the consumer, understandably, gets buyer's remorse and just forgets about taking advantage of the TV's 3D functionality. However, with just a few tweaks to your TV's picture settings, you can enjoy a better 3D viewing experience. Check out some useful tips for adjusting the picture settings on a 3D TV. As 3D continues to make inroads into the home theater and home entertainment environment, consumers are faced with upgrading their TVs and adding or upgrading to a 3D Blur-ray Disc Player. However, what about that home theater receiver? The good news is that in the audio area surround sound formats do not affect 3D operation. However, depending on what home theater receiver you have determines how you might make the physical audio connections between a 3D-enabled Blu-ray Disc player and the home theater receiver. In other words, if you really want to be fully 3D signal compliant across the entire connection chain of your home theater system, you need to have a receiver that is 3D compliant by having HDMI 1.4a connections, especially if you rely on your home theater receiver for video switching or processing. However, you can avoid this additional costly upgrade by planning ahead. Find out three ways you can still use a non-3D compliant home theater receiver with a 3D TV and 3D Blu-ray Disc player.